Description of Property: The gîte has 2 bedrooms (1 double and 1 twin), sleeping 4, with a kitchen/dining room, a lounge area and a bathroom with basin, W.C. and bath with shower over. Gîte 4 has an extra room downstairs without a window that can be used as a 3rd bedroom. 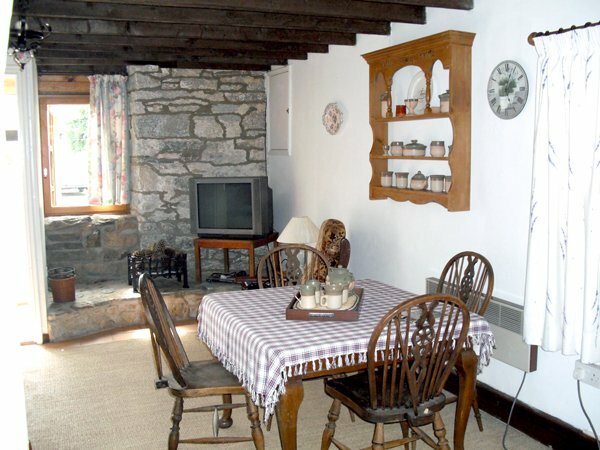 The cottages have exposed beams and are fully furnished with traditional furniture. Floors are tiled with rugs or carpets. 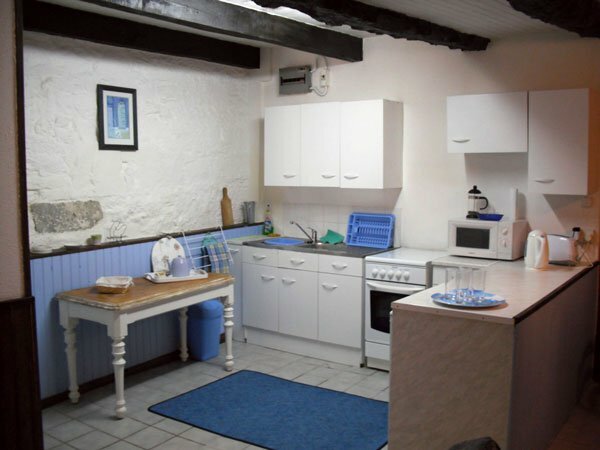 Kitchen is equipped with conventional oven, hob, fridge/freezer and microwave. A washing machine and dryer are available in an outhouse. The house is well appointed with electric heating throughout, and wifi/telephone is available. Outside Amenities: Gîtes Kerdrean is set in 2-3 acres of land, so there's ample space for everyone to enjoy their private haven of peace in the yard. A large enclosed garden (mainly south facing) surrounds the house, and is suitable for pets. There is ample parking space and a field with a stream at the bottom, all enclosed by trees. There is a modern playground for children, and an open hangar for making BBQs, as well as a pizza oven available to guests. 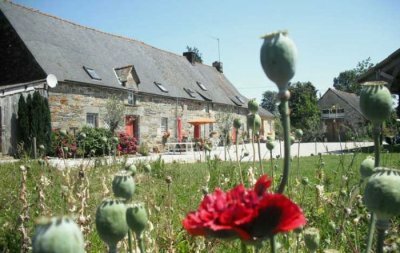 Ideal as a base to explore Brittany, or for house hunting. 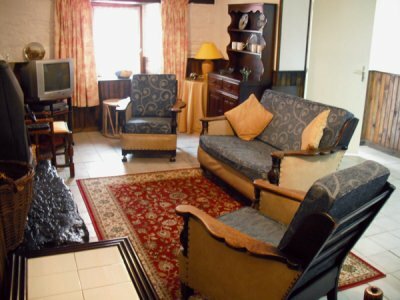 Benoit is also an English speaking estate agent in the area, so can tailor house visits for you during your stay, making finding your dream home in France both fun and relaxing while on vacation! Surrounding Area: The Lac de Guerledan is an amazing attraction, with it's sandy beaches and restaurants overlooking the pristine lake. There are many other walks in the area including within the extensive Quenecan Forest and along the towpath of the Canal de Nantes a Brest all the way to Pontivy and beyond. Close to many attractions within easy reach of the Abbaye of Bon Repos, which has a market every Sunday morning and is close to Lac de Guerledan, which has two sandy beaches suitable for swimming and boating and surrounded by woodlands which enable walks around the lake. Cleguerec is 2 kms away, and has a supermarket open every day (exceptional in France! ), a few bars and restaurants, 2 bakers, a butchers, GP, dentist, flower shop, garages, hair dressers, a brocante, creperie. The area is surrounded by lakes many of which you can fish using a daily pass and only five minutes away. There are many places to visit but too many to list! The Napoleonic town of Pontivy is just down the road 14 km away. 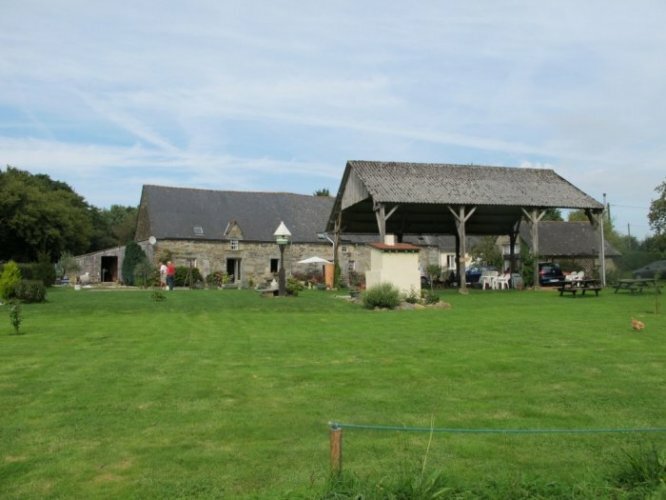 In Pontivy there is a large open air swimming pool with lawns and slides and in the town centre an indoor pool. A large market is held every Monday in centre of Pontivy and all the surrounding villages have markets and brocantes (boot sales) and we even have some charity shops. If you are into fresh air the local area is amazing for long walks. There are many other walks in the area including within the extensive Quenecan Forest and along the towpath of the Canal de Nantes a Brest all the way to Pontivy and beyond. There is a range of fishing opportunities inland as well as on the coast; N and S Brittany coasts are within 60 km. There is a 9-hole golf course 30 km away (near charming St. Nicholas des Eaux) and 2 18-hole courses near Lorient. Wood burning stove with free firewood available included in rent. Mains water. Septic tank. Electricity. Telephone. WiFi Broadband Internet Access. Television. Satellite TV. VCR. DVD. Alarm. Conventional oven. Hob. Microwave. Fridge. Combined Fridge/Freezer. Washing Machine. Tumble Dryer. Children welcome. Very welcome as we have some of our own! 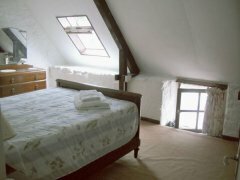 Pricing Info: From 450 euros to 550 euros per calendar month plus electricity. Linen available for hire.